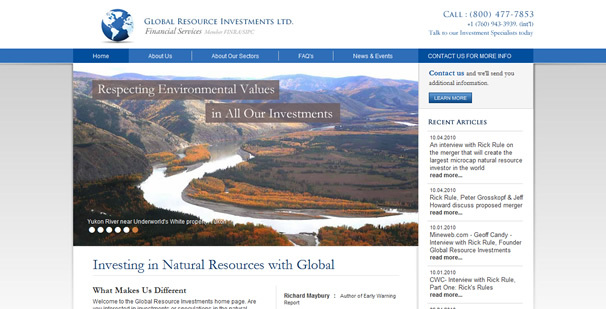 Fresh From the Ninthlink Team : Global Resource Investments Ltd.
We launched our latest site yesterday for Global Resource Investments LTD., or simply GRIL as it came to be known around the office. With their focus on helping investors and speculators make money in the natural resource business, they came to Ninthlink to create a website to be used as a marketing tool and educational resource for their clients. So that’s exactly what we did by presenting a professional site helping to clearly lead potential and existing investors to the information they need and towards the actions we hope they will take. Special thanks to Travis for his work on the design and Alex for making it a reality.